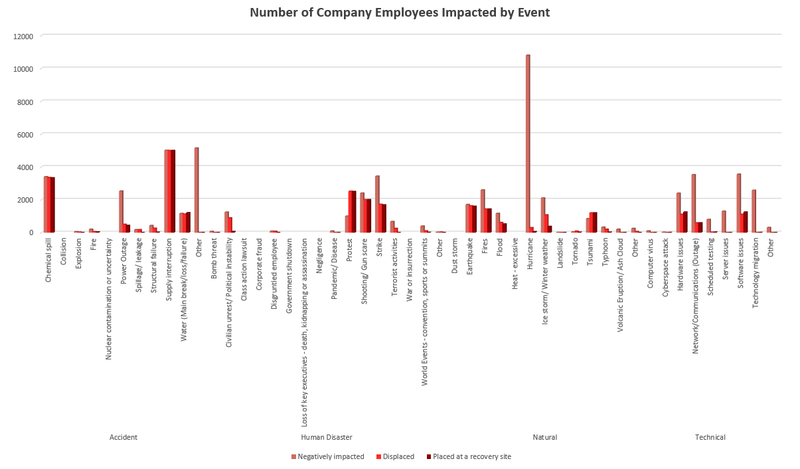 Event Impact Management Study - Initial Study Findings - How Have Events Impacted Company Employees? - BC Management, Inc. Event Impact Management Study - Initial Study Findings - How Have Events Impacted Company Employees? Just Three Weeks until our 6th Annual Event Impact Management Study Closes and We're Assessing the Study Findings. Study is live through March 31, 2016. Click on image above to view a larger data graph. ​This survey will be used to assess how specific events have impacted organizations by highlighting what was activated in times of an event, the impact to the business, the impact to the personnel, downtime as well as the estimated financial loss by event. Only study participants will receive a complimentary report assessing the data findings collected from this annual study. · Study questions and assessment of data is completed by BC Management's International Benchmarking Advisory Board.